more than words: Is there such a thing as shopaholics anonymous?! Is there such a thing as shopaholics anonymous?! During July, I spent the whole month flitting between work and an empty flat. I had no exciting plans, no money and I was in dire need of human conversation with someone other than a customer. The month seemed to drag on forever and I couldn't wait for it to end so that I could look forward to all the fun plans ahead for me in the following month. Now we are 2 weeks into August and as predicted, I have been rushed off my feet! I have been to Leeds, Manchester and of course in and out of Huddersfield which is where I live. I have met up with friends, seen a lot more of my boyfriend and just genuinely had a lot more fun already this month. One of the things I have been doing a lot of, is shopping. So much so, that I am now ridiculously skint and worried that I may have an addiction to buying things! With this in mind, I decided to show off some of the things I have been buying lately. Most of these items have already been worn, so I'll do my best to remember the prices, or at least give a rough idea. This first outfit is something I wore to my boyfriend's gig in Manchester earlier this week. 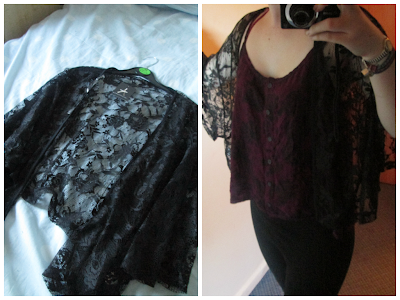 The top is a simple black lace crop top which was around £5 from Primark. I was thrilled to find this, because I recently bought a similar one from Topshop and had to return it, as it was too tight and didn't fit nicely. This top however, is a great alternative for a fraction of the price. 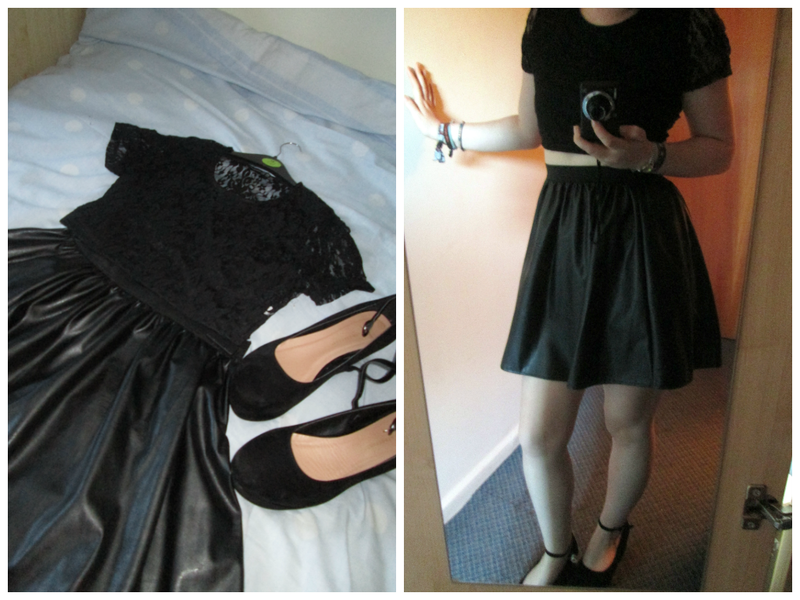 The leather look skater skirt was also from Primark at around £5 - a complete bargain when most places are selling them for £15 upwards. To finish off the outfit, I wanted some flatforms and luckily I managed to find these little bargains in Primark for £12. They are black with a suede/velvet feel, and have a dainty little ankle strap, which takes emphasis away from the chunky platform. I am in love with these shoes as they are so comfortable and will go with any outfit. Flatforms are great if you are useless in heels and can only cope with a wedge, like me. I just know these will be my go-to 'going out' shoe from now on. 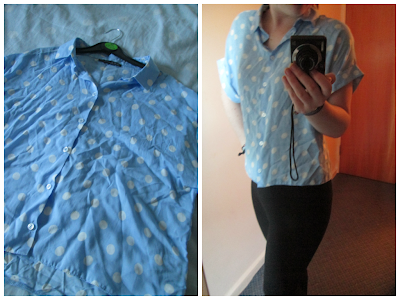 The next item I bought from Primark is pretty basic but I am so in love with it, that I bought 3! (ooops!) It is simply an oversized batwing sleeved jumper, in a marl purple colour. The reason I bought 3 of these is because they are incredibly comfortable and look great over a pair of plain black leggings. 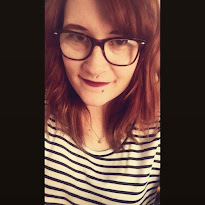 They were an absolute steal at £5 each and have a lovely fitting, which comes lower at the back and sits slightly off the shoulder. In keeping with the music theme, I also visited one of my favourite stores - Pulp. I always love having a browse at all the alternative clothes in this store, but rarely buy anything as I'm always skint! 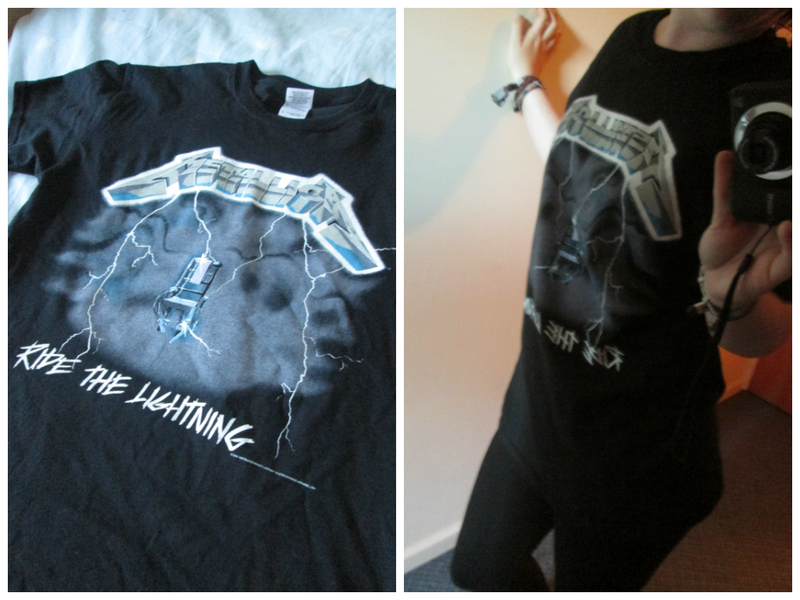 However, this time they had an offer on any 2 band t-shirts for £25, which I thought was fantastic, because some places sell one for that price. So me and my boyfriend took full advantage of the offer; me with this Metallica tee and him with a rather obscene Johnny Cash one. We got two t-shirts that we both love for only £12.50 each - bargain! 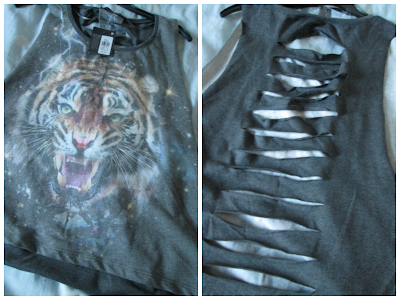 The next top I bought was again, from Primark. I saw this and shoved it straight in my basket because I just thought it was really cool! A tiger's face on a galaxy style background - whats not to love?! 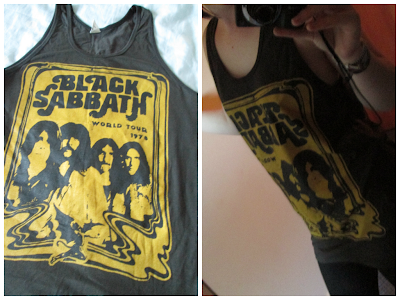 I also love the cutout back on this vest and it was only £6 so I didn't even think twice about buying it. Apologies for how creased this blouse is! I have worn it to death over the last week! This isn't something I would normally buy but for some reason I just love it. It looks really vintage and 80s, but it was actually from Primark. It was £10 which in comparison to some of the other Primark things I have bought, is a bit more expensive, but I have probably got my moneys worth out of it already! This lacy shrug is from Primark and was £6. I picked it up because I thought it was a nice alternative to a cardigan on a night out or just to put with a nice dress. I love how floaty and wide the sleeves on it are. Plus its lightweight enough to fit in my bag if I'm out and don't want to wear it. Primark had a few other nice shrugs in other styles so its worth having a look even if lace is not your thing. Finally something not from Primark! 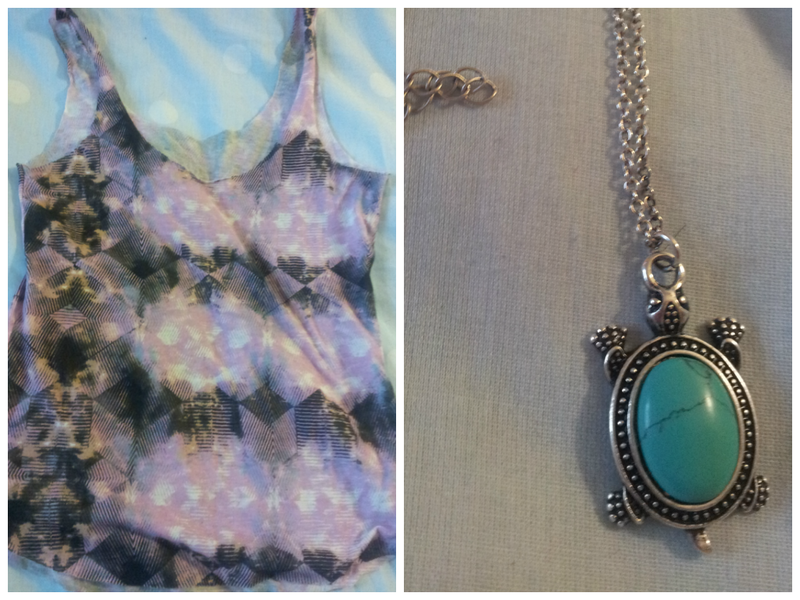 These are both from Urban Outfitters, which is one of my favourite shops. I actually did quite well buying these two as they came to less than £25 with student discount and I am notoriously known among my friends for my Urban Outfitters sprees. The vest is a pinky purple colour with a cool pattern and is quite small and lightweight, perfect for Summer. 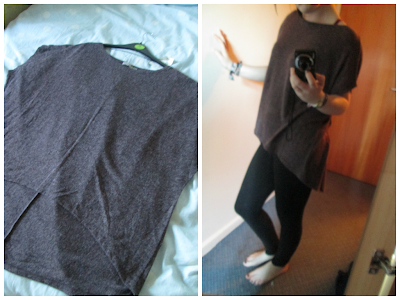 It was only £12 which is really cheap for UO. The necklace was quite expensive at £14, but its a turquoise turtle for the love of God! I love turtles and I'd been eyeing this up for quite a while so I had to have it! The final thing I'm going to post is possibly my favourite. It is considerably more girly than all the other things I've bought lately but its so pretty, and fits so nicely that I just love it. I saw this on Facebook by a page called Bows Boutique which I was unaware that I had 'liked' so it was more than a pleasant surprise when this came up on my timeline. The print on the dress is really nice and Summery. The actual dress itself is also really flattering. It is a skater style dress, and also has a little padding on the bust area which is great for me. I haven't had the opportunity to wear this out yet but I can't wait til I do as its beautiful. After writing this post its suddenly very obvious why I am so poor at the minute! This is not even half of the things I have bought lately but I would be writing this forever if I featured everything. There are also a few things I have bought which I'm not too sure on, so there could be another Ebay session very soon! Hopefully its not just me that can be this reckless when it comes to shopping! 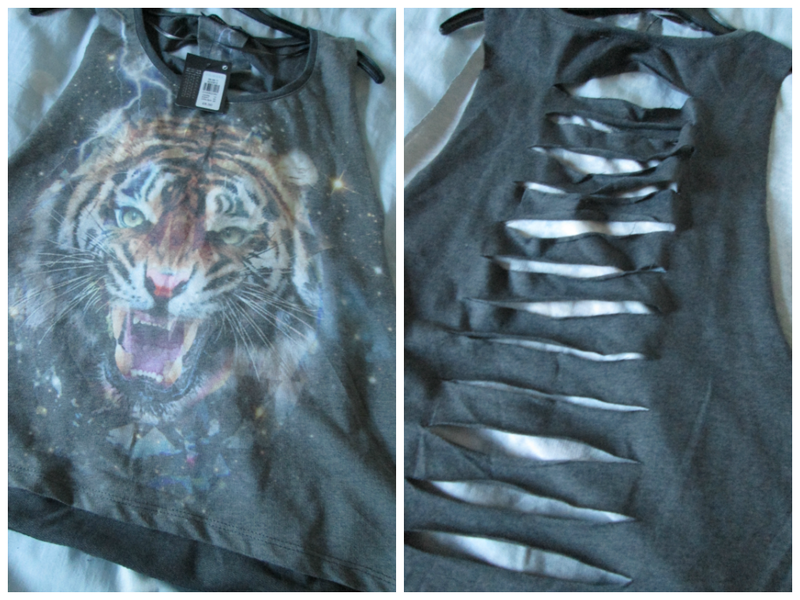 I love that tiger top! I love that blue necklace and floral dress! So pretty! :)) Check out my blog if you get a chance! Beautiful looks!! would you like to follow each other with GFC and Bloglovin? Love that floral dress! I'm looking for something similar for Spring. Really cute clothes. 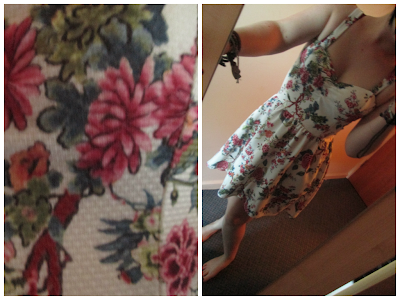 Love the flower dress so much.